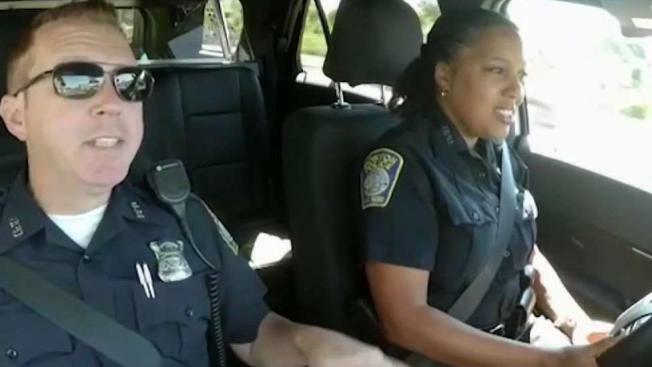 Two Boston police officers are showing off their singing talents in a version of "Carpool Karaoke" they're calling "Cop Pool Karaoke." A fun, patriotic video of two Boston Police Department officers singing "God Bless America" caught the eye of one famous musician who invited the duo on stage for his next Massachusetts stop. The viral "Cop Pool Karaoke" video reached country singer Brad Paisley, who was so impressed with the duo’s performance that he reached out to them Wednesday via Twitter. "Happy 4th everyone!" the musician wrote on his repost of the video. "Oh and if you officers wanna sing when I play MA in August, open invite." Officers Kim Tavares and Stephen McNulty, the stars of the viral video, have yet to reply to the offer. Their performance also inspired the New York Police Department to post their own version of "Cop Pool Karaoke."